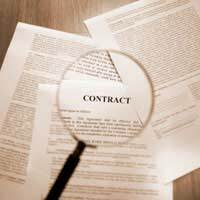 Contract clauses are a list of terms and conditions placed in a contract that govern liabilities and obligations. In most cases the contract clauses will include issues such as statutory rights, implied terms, and the expectations and responsibilities of both parties. When the time comes to sign a contract, whether it is a consumer credit contract or commercial builder's agreement it is vital to check the small print found in contract clauses. Some contracts can seem long winded and can be sprinkled throughout with Latin phrases and legal terminology, but they do need to be read thoroughly before any signature is granted. Contract clauses are usually small statements placed within the contract, but in some cases entire contract clauses can be placed within a contract. These clauses can work to the detriment of other statements made within the contract and can be used to limit any liability or obligation on the part of the person offering a service. In many contracts there are clauses known as penalty clauses. These clauses are designed so that when a party breaches a contract a financial penalty can be applied. One of the main reasons behind this type of clause is that if a contract is breached then the non breaching party will be able to claim a financial penalty without taking the dispute to court. With common consumer credit contracts you will often find contract clauses stating terms such as financial penalties for early repayments of loans. There can be clauses stating how much APR will be accrued for missed or late payments and clauses on fees and charges. There are literally thousands of different clauses that can be applied and most are dependant on the type of contract. Many are placed in contracts after legal advice but many can be placed in a contract at the discretion of the person drafting the contract. There have been many cases of artist, musicians and writers signing away their rights to their own works simply by signing a contract without reading all of the small print. It is simply not enough to skim over the clauses in a contract, they should be read fully, and legal advice should always be sought for contracts that include the exchange of large amounts of money. Clauses can be placed into a contract that will basically give the provider of the service the right to apply and change certain requirements and obligations. However, this does not mean that the party offering the service has the right to do this. If a contract has terms and conditions that represent a large imbalance in favour of the person who is making the offer then this can be seen as an unfair contract. If a dispute did arise and the matter was taken to court then the judge could make a decision of an unfair contract based on the contract clauses alone. There are some contracts that will include clauses that are close to unreadable. There will be complicated legal phrases included and statements and terms that are hard to understand. According to the Unfair Terms in Consumer Contracts Regulations (UTCCR) clauses must be expressed in a clear, intelligible language and in plain English. These terms can be deemed unfair and can be challenged if the person who signed the contract could not understand the meaning of the terms and conditions. Simply taking the time to read the small print and clauses contained within a contract should alert you to the fact that it is either illegal or unfair. For example, an employment contract that does not include statutory rights may be deemed illegal. The employee's statutory rights are a legal requirement, and they should either be written into a contract or held in another place within a company. If an employer refuses an employee the right to see that their statutory rights are held somewhere then this can be illegal and legal advice should be sought. There is really no excuse for not taking the time to read a contract fully, including all contract clauses. Reading contract clauses and understanding them may stop the acceptor of the offer entering into an iron clad contract that they may regret at some later point. If there is any doubt over the meaning of any clauses then legal advice should be sought and no signature should be granted until clarification has been made. @watbor - did they give any reasons why they wouldn't be starting the job? Have you read the contract to see if they have any get-out clauses? It all seems very odd - given that they presumably need the work, yet have backed out of the contract. on 22nd june 2014 i entered a fixed pricecontract with weatherall exteriors of glasgow to re-roughcast my house and paid a deposit of 10%. the company rep wrote on the contract that the work would be carried out within 4 to 5 weeks of the contract being signed which i was very pleased with. i was given a contact number of the man who would be doing the work whoi later found out was also the owner of the company to confirm when the work would be done. after several phone calls and promises that he would be arriving with his team to start, the work has still not been done. he did deliver some bags of roughcast pebbles to my house about 3 months after the contract was signed and the next day phoned me to say he would not be honouring the contract and the deposit money would cover the cost of the materials he had delivered. in september i sent him a letter telling him i was seeking advice on how to get this contract honoured and i got put in touch with east dumbartonshire trading standards who say they are looking into the matter. since they got involved in september i have had one email confiming their involvement and have spoken to them once for an update which told me nothing. i phone them every week to try to find out what is happening, but they neverreturn my calls. i have written this story in the hope that someone can advise me on what to do next to try and get this contract completed. your sincerely watbor.